Before proceeding to Monstery’s treatise, however, it is worth taking a short look at the history of this weapon in Britain, Germany, and Scandinavia, and charting its use through the last few centuries—especially focusing on the period between 1740 and 1860, about which very little has been written during the modern era. The staff technique of Andre Paurñfeyndt (1468-1540), illustrated in Egenolff’s version. 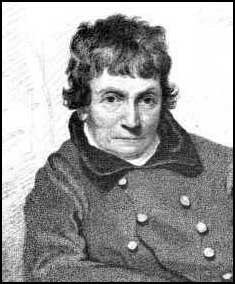 Harry Smith passed away in Chichester, in 1822, at the age of 84. 18th century trade card purporting to show James Figg offering instruction in the use of the quarterstaff. The authorship of this etching is uncertain and has been attributed to both William Hogarth and Joseph Sympson. Source: MET Museum, New York City. To the Editor of Bell’s Life in London. SIR— I would beg through the medium of your useful and entertaining Paper, which has so large a circulation in the sporting world, to express a wish I have long indulged, to witness the revival of the ancient, noble, and manly exercise of Quarter Staff, so successfully practiced by our hardy ancestors, and which is now nearly lost, being known only to a few individuals. Should I succeed in establishing a Society for its practice, I shall most cheerfully subscribe my might to its support, and contribute any assistance in my power to its formation; and beg to subscribe myself, Sir, yours, &c.
Beginning in the early 1850s, the quarterstaff became featured in various Grand Assaults-of-Arms and military tournaments throughout Great Britain (see advertisement below). 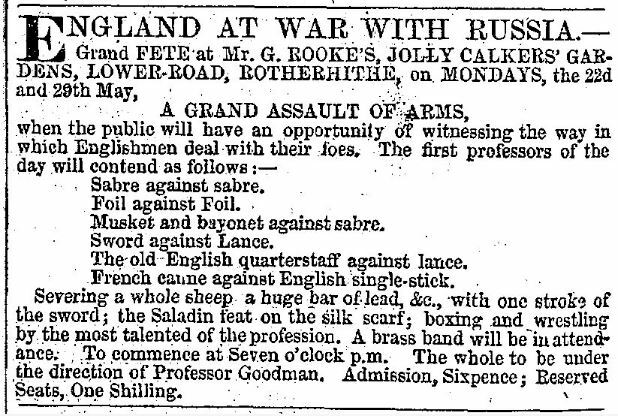 1854 announcement for a Grand Assault of Arms involving the “old English quarterstaff” under the direction of a “Professor Goodman,” published in the Era, on May 21. Later, in 1862, Robert Kemp Philp stated that, “the inhabitants of some of the northwestern counties of England are still remarkably expert at the quarter-staff, and take great pleasure in the play of it.” And that same year, Professor John C. Gregory, an instructor at the Leeds Gymnastic Club, began holding a number of Grand Assaults-of-Arms throughout Britain (at venues such as Victoria Hall in Leeds, and the Crystal Palace in London), at which figured “rustic sports,” including contests and demonstrations of the “Old English Quarterstaff” (see image below). Some of these contests, it was noted, were held before the Queen of England. From Wells Journal, July 12, 1862. Above: A quarterstaff assault at the London Athletic Club, 1874 (from the Graphic, Vol. 10). During the 1880s and 1890s, British treatises on staff technique would be published by practitioners Thomas McCarthy, R.G. Allanson-Winn, and C. Phillips-Wolley. 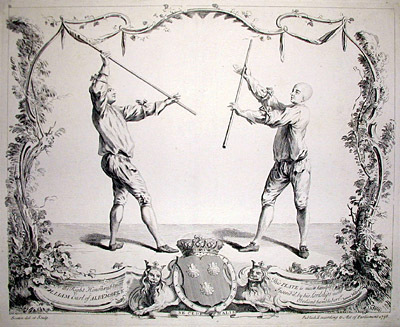 According to the writings of noted duelist and fencing master, Colonel Thomas H. Monstery, a tradition of quarterstaff fencing survived into the nineteenth century in his native Denmark, as well as in neighboring regions of northern Germany, where it was taught to members of the peasant militia, primarily for use in riot control. Monstery states that the staff exercise was still being taught in those areas, or were when he was a “youth.” Given Monstery’s date of birth, this would have been during the 1830s or early 1840s. Above: Defense against staff weapons in the system of Pehr Henrik Ling (founder of the Central Institute of Physical Culture in Stockholm), illustrated and published in the 1850s by a disciple of Ling’s system. Monstery trained at the Central Institute, where, according to his biography, he was certified as a Master of Arms. Image from the author’s collection. It is, perhaps, here worth noting as an aside that staff weapons, generally speaking, were still used by various European militaries during this period. Likewise, weapons such as the quarterstaff, the spear (used by militias), and the pike (still utilized in naval boarding actions) were part of the curricula at certain Germanic and Scandinavian military academies. The special Austrian Military Teachers’ School at Wiener Neustadt, for instance, one of the Imperial Institutions for Military Education, maintained a curriculum that included “Staff, Rapier, Sword and Bayonet Fencing.” This school was charged with the task of training and providing “instructors in gymnastics and fencing for all the military schools and for the troops.” (20) Likewise, the Central Institute of Physical Culture (Kungliga Gymnastiska Centralinstitutet) in Stockholm, founded by the celebrated Dr. Pehr Henrik Ling (himself a fencing master), offered instruction in the use of the pike and spear. (21) The Royal Military Gymnastic Institute (Kongelige Militaire Gymnastiske Institut) at Copenhagen, directed by Franz Nachtegall, also included the quarterstaff as part of its fencing curriculum. It was at this last-mentioned institution, the Royal Military Gymnastic Institute at Copenhagen, where Col. Monstery learned to handle the “sword, musket and bayonet, rapier, cudgel and quarterstaff” during the 1840s. 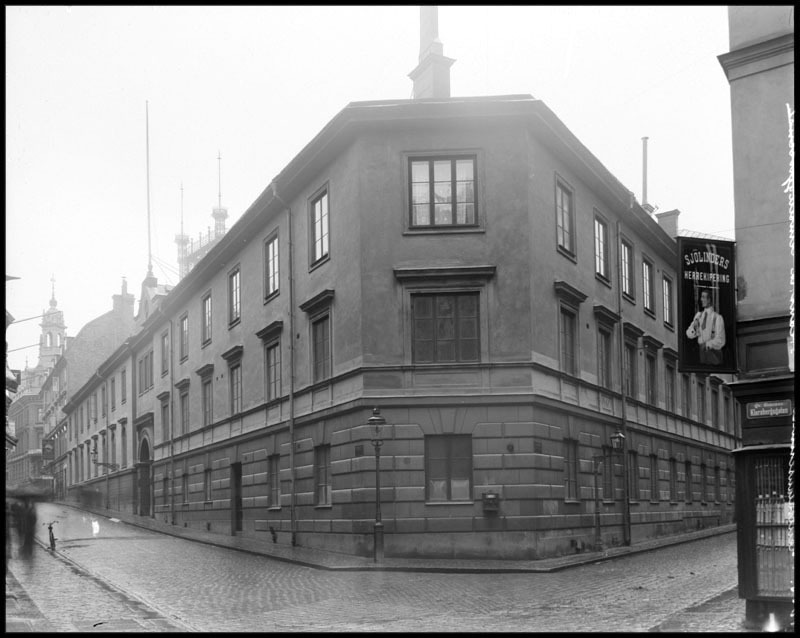 (22) Monstery also continued his studies at Ling’s Central Institute of Physical Culture at Stockholm, which (as previously noted) included the use of other staff weapons in its curriculum. A man with his staff, or alpenstock, from Miesbach, Bavaria. Above: One of several illustrations from the quarterstaff section of Monstery’s treatise, showing an exercise to give “ease and suppleness.” Photograph of original from the author’s collection. In his lessons, Monstery instructs the reader to use a staff as high as one’s head. His technique includes a variety of guards, parries, “blows,” feints, and includes both “cutting” attacks as well as thrusts. 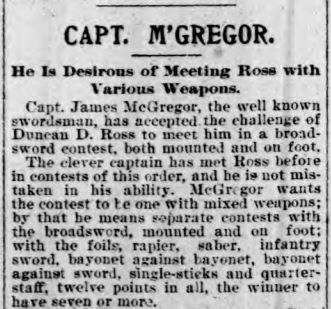 Above: Monstery’s former assistant, Captain James McGregor, accepts Ross’s challenge in the Buffalo Courier-Record, 1897. Above: Another challenge from McGregor, to Pavese, published in the Buffalo Evening News, March 5, 1899. 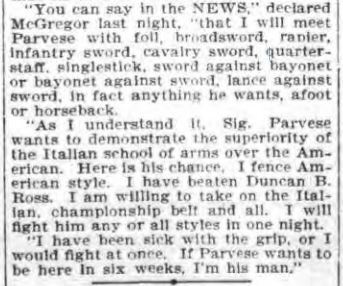 McGregor’s comment (seen in the image above) that he fenced “American style” is an interesting one, given his British origins. Whether McGregor was using Monstery’s quarterstaff technique in these contests, or a system that he learned in his own country, is a matter of speculation. 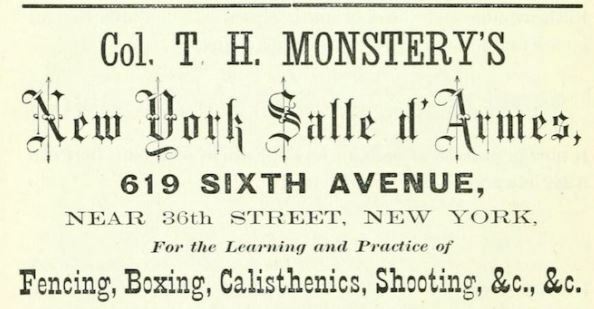 Whatever the case, the report is evidence that as late as 1899, quarterstaff fencing was still alive and well in New York State. Additional articles about Thomas H. Monstery can be found here as well. Thomas Hoyer Monstery, Self-Defense for Gentlemen and Ladies (Berkeley: North Atlantic Books, 2015). Minutes of the Common Council of the City of New York, 1675-1776 (New York: Dodd, Mead and Company, 1905), Vol. 1, 94. Donald McBane, The Expert Sword-Man’s Companion, Or the True Art of Self-Defence. With An Account of the Author’s Life, and his Transactions during the Wars with France. To which is Annexed, The Art of Gunnerie (Glasgow: Printed by James Duncan, and are to be sold at his Shop in the Salt-Market, 1728), 66-67. Rev. John Wesley, Sermons on Several Occasions (New York: Carlton & Phillips, 1855), Vol. II, 271. In 1788, Christopher Towles, of High Street, in Coventry, offered instruction in skills “of the greatest use in the Army and Navy,” such as “the Single-Stick, Quarter-Staff, Broad-Sword, Small-Sword, Wrestling, Boxing…” Advertisement (originally from 1788) reprinted in the Northampton Mercury, Oct. 22, 1842. The Gentleman’s Magazine (Westminster: John Nichols and Son, 1822), 286. Cambrian and Caledonia Quarterly Magazine and Celtic Repertory, Volume 5 (London: H. Hughes, 1833), 61. See also Ditchfield, 38, 54. Cobbett’s Weekly Register, August 10, 1805. Lt. John Russel, A Series of Military Experiments in Attack and Defence, Made in Hyde Park in 1802, Under the Sanction of His Royal Highness the Commander in Chief (London: T. Egerton, 1806), 210. Nestor Lonchophoros [Major John Cartwright], Military hints to the Greeks (London: Richard and Arthur Taylor, 1821), 5. Lt. Col. Baron De Berenger, Helps and Hints how to Protect Life and Property (London: T. Hurst, 1835), 255. John Bowring, The Works of Jeremy Bentham (Edinburgh: William Tait, 1843), Vol. IX, 342. 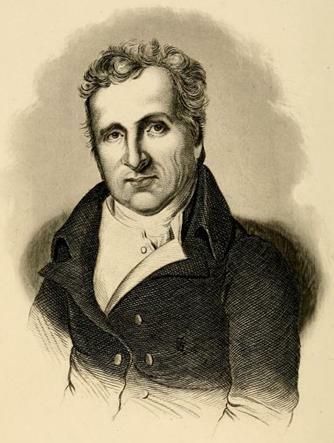 Colonel Willoughby Verner, The Military Life of H.R.H. George, Duke of Cambridge (London: John Murray, 1905), Vol I, 332. The resurgence in the 1860s can be documented by a number of accounts in the British media; see, for instance, Leeds Mercury, January 11, 1866; London City Press, March 31, 1866; Sporting Life, March 31, 1866; Brighton Gazette, Dec. 20, 1866; Chelmsford Chronicle, April 12, 1867; Aldershot Military Gazette, June 13, 1868; for the 1870s onward, see Tony Wolf, “‘A Grand Assault-at-Arms’: Tournaments and Combative Exhibitions in Victorian England” in The Journal of Manly Arts (August, 2001). Monstery, Self-Defense for Gentlemen and Ladies, 165. Report of the Commissioners Appointed to Consider the Best Mode of Re-organizing the System for Training Officers for the Scientific Corps (London: Eyre and Spottiswoode, 1857), 215. Monstery, Self-Defense for Gentlemen and Ladies, 4. Ben Miller, A Grand Assault-of-Arms in Old New York, Directed by Colonel Monstery, 2015. Monstery, Self-Defense for Gentlemen and Ladies, 163-174. Although the Chicago-based instructor Giuseppe Riboni published a book in 1862 entitled “Broadsword and Quarter-staff,” the weapon referred to as the “quarter-staff” therein is actually the Italian bastone a dui mani. See Giuseppe Riboni, Broadsword and quarter-staff without a master: broadsword fencing and stick or quarter-staff play, after the latest European practice adopted in the military schools of France and Italy, and the United States (Chicago: E. B. Myers: 1862). New York Herald, July 22, 1875. Army and Navy Journal, April 22, 1876. Buffalo Courier-Record, October 15, 1897. Text of this article © 2015 by Ben Miller. Reblogged this on Out of This Century.